Antimalarial drug resistance remains a key public health challenge for health workers, policy makers and researchers. We know that many countries have insufficient clinical trial data and funding to reveal the full picture of how different antimalarial medicines are working and failing to cure patients. By working in partnership with national research institutes, it is possible to identify opportunities for new clinical trials to build the evidence base and fill the gaps in data that is needed, or identify lost or missing information. The WWARN Explorer is a tool that can help identify this information gap. Whilst the WWARN Surveyor tools display data from published materials, the Explorer is an interactive map that allows researchers to visualise results of trial data from antimalarial resistance studies. This view allows the user to filter results by type of study, country, time range and antimalarial drug. The Explorer has been updated with many more studies from malaria endemic countries such as Peru, Cambodia, Nigeria, Ethiopia and Sudan, providing the malaria research community with a continually updated overview of the global drug resistance challenge. The interactive map now displays data from an estimated 177 clinical studies, 103 molecular studies, 19 pharmacology studies, and 29 countries with in-vitro data. WWARN Explorer links our repository of standardised data into an interactive mapping application allowing anyone to perform custom queries of a large number of studies and to visualise summary results using dynamic mapping. The data analyses are based on standardised individual sample data, thus enabling outputs from different studies across the world to be compared with greater confidence than is possible when comparisons are based on aggregated results from publications. “The Explorer can facilitate connections for researchers interested in similar issues. Someone working in an isolated area in Cambodia can search and identify a researcher over the border in Vietnam, or a researcher using similar treatment approaches in Africa,” suggests Clarissa Moreira, Senior Data Manager at WWARN. “Data contributors can also benefit from the standardisation and analysis of their data, the provision of a secure data repository and increased visibility of their work. 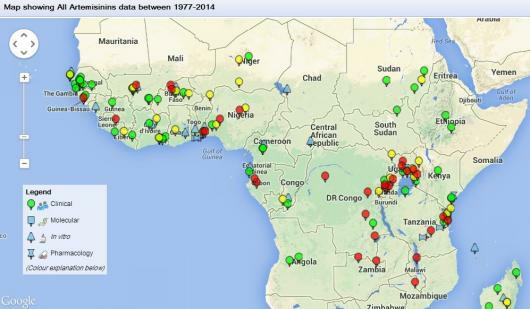 As the data archive grows, the tool is providing a more comprehensive picture of the emergence and spread of resistance,” adds Dr Louis Penali, West Africa Regional Director at WWARN. Some new filter features are being developed at the moment to allow users to tailor the Explorer view even more. The update will include a filter to view separately the patient-treatment outcomes when drugs are given as fixed dose (two drugs in the same tablet) or non-fixed dose (two drugs in different tablets) combinations. Visit the Explorer again soon to test these new features. “Knowing where we have gaps in our knowledge of antimalarial resistance is as important as collecting existing data; these proposed updates and new functionality will help to highlight where and how we need to focus our collective efforts,” concludes Carol Sibley, Scientific Director at WWARN. If you have any issues viewing the data on Explorer, please reload the website page to visualise the data. We welcome your feedback, email explorer [dot] feedback [at] wwarn [dot] org with any access issues, to share your ideas or to share your data.